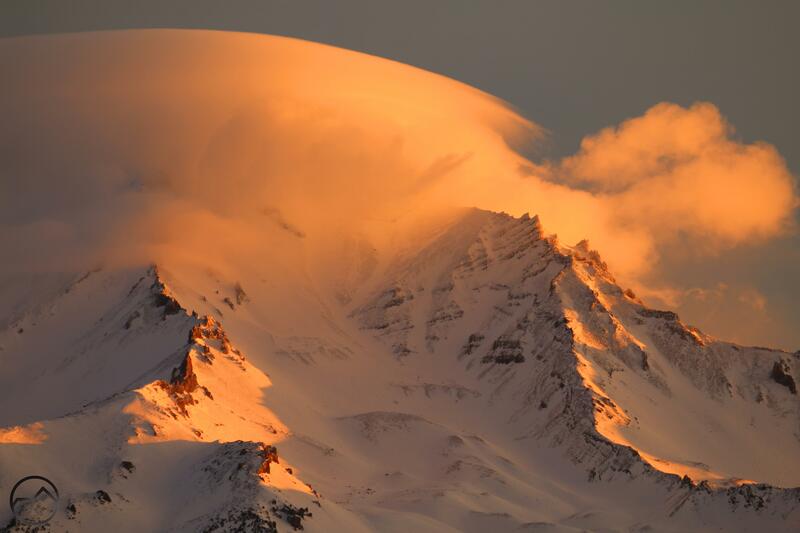 A stunning lenticular cloud coalesces around the summit of Mount Shasta. Christmas is nearly a week behind us and it has been a fun week of heading out on a few early mornings and some beautiful afternoons to capture the sunrises and sunsets. This was made all the more satisfying because I got to try out the new zoom lens that my amazing wife blessed me with for Christmas. My old lens was nearly worthless in a variety of ways and my wife finally decided to put it out of its misery and she gifted me a significant upgrade. I am most grateful and was glad to put it to good use. I have already captured a number of images that allow me to see detail heretofore unimaginable with the old sad lens. Below is an example of how much better my new lens is. 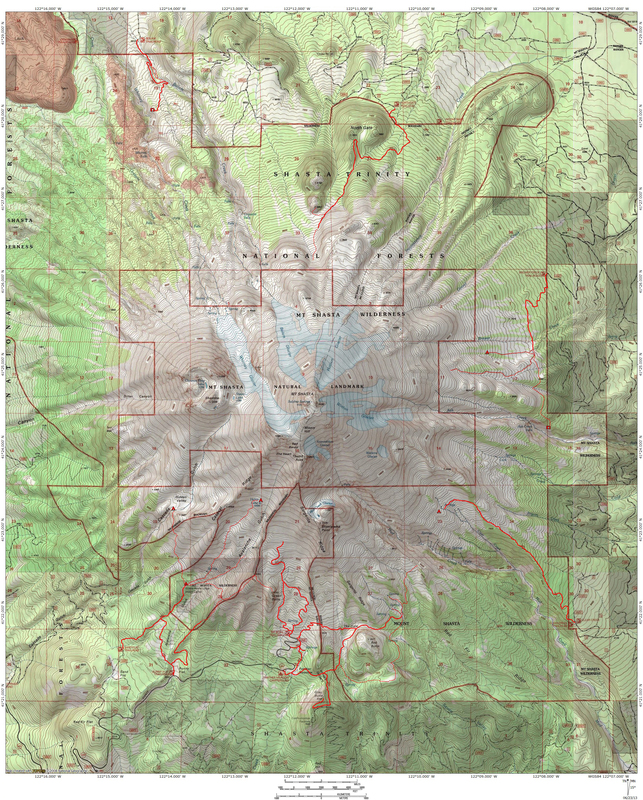 Compare the image with those found on this post from October, describing my wife and son’s assent of Black Butte. Click on the image to enlarge it and really get a sense of the detail. The image was taken from my front yard. The old lookout tower foundation is clearly visible. The snow and rime ice on the trees shows up with excellent clarity. It is like a whole new world has been opened up. This was not an especially amazing sunrise but it was the first opportunity I had to get out and use the new lens. The clarity and crispness of the image is far greater than I had the ability to do previously. Wind has whipped the snow off of the Heart. We need a big storm to build up the ice there. Friday night was when things tarted to get really interesting. A lenticular had been threatening to form over the mountain all day but in the evening it started to gain a lot of definition. I headed north to the Shasta Valley and was extremely pleased that I did. 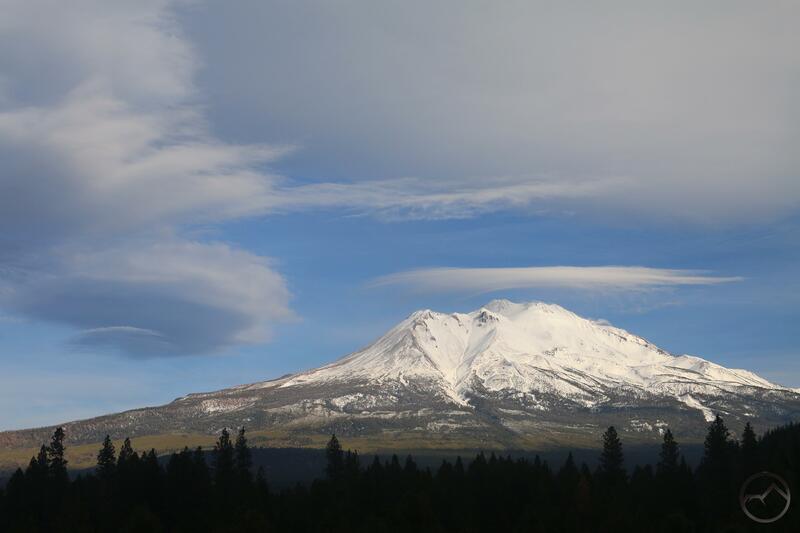 The stack of disks on the mountain had been joined by a nice pair of lens shaped clouds floating off to the west of Mount Shasta. The sky burned as the sun set and the entire scene was magnificent. Satisfied, I headed home, though I had a suspicion that the next morning would yield another spectacular image. The air just felt like Mount Shasta wasn’t done putting on a show. I made sure to be up early in order to maximize the potential lenticular display. I had originally planned on heading for the perch up near Castle Lake but as I drove past Lake Siskiyou I saw the water was still. It has been a long time since I have gotten a decent reflection there and I could not resist heading down to the water. I am glad I did! I initially like the one on the right better but now I am leaning toward the earlier image, on the left. The image at the top of this post was taken at the same time. I am amazed at how much detail on Mount Shasta I was able to capture even though I was 10.5 miles away. Every aspect of this sun rise was fantastic! 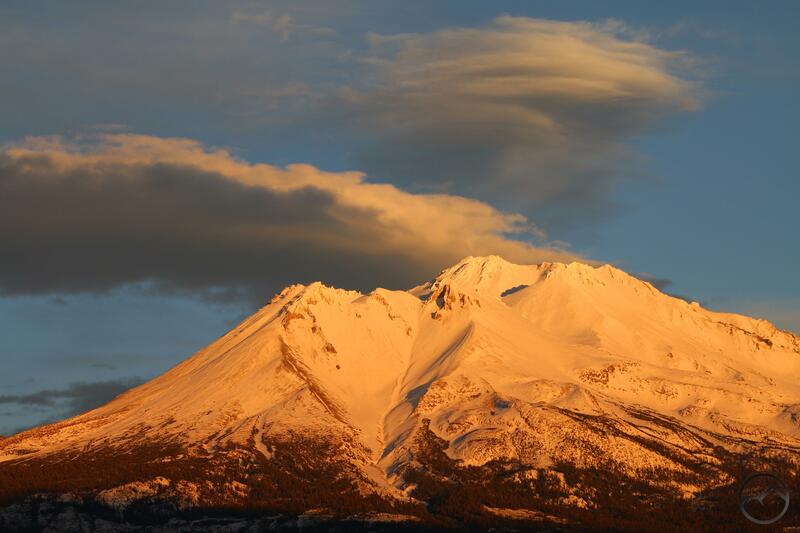 Although a single, large lenticular had formed south of Mount Shasta that afternoon, I decided to forgo trying to capture it at sunset, as I had lots of family still at my house and I we were having a merry time. Nonetheless, the next morning on Sunday, I once again headed out to capture the sunset. This time I headed over to McCloud and enjoyed the sun light illuminating all the crags of the Mud Creek Basin. This is the best perspective on sunrise! The day eventually got overcast and a large stack of lenticulars once again formed over Mount Shasta. I determined to set out around sunset and see if there was enough light to capture the clouds in their glory. However, by the time I was in a position to photograph the mountain, conditions had changed considerably. It was still glorious. Though not the large set of disks, the single current of cloud was quite elegant and beautiful. With the late-forming lenticular lingering late into the night, I thought there might be a chance for another big display this morning. I headed out extra early only to find there were no clouds on Mount Shasta. However, as I was about to get on the freeway in Weed, I saw a MASSIVE meteor descend through the sky to the southwest. It lit the sky up and I could see the smoke plumes in its contrail. It was 6:50 AM and I have no idea where it hit but it was big. 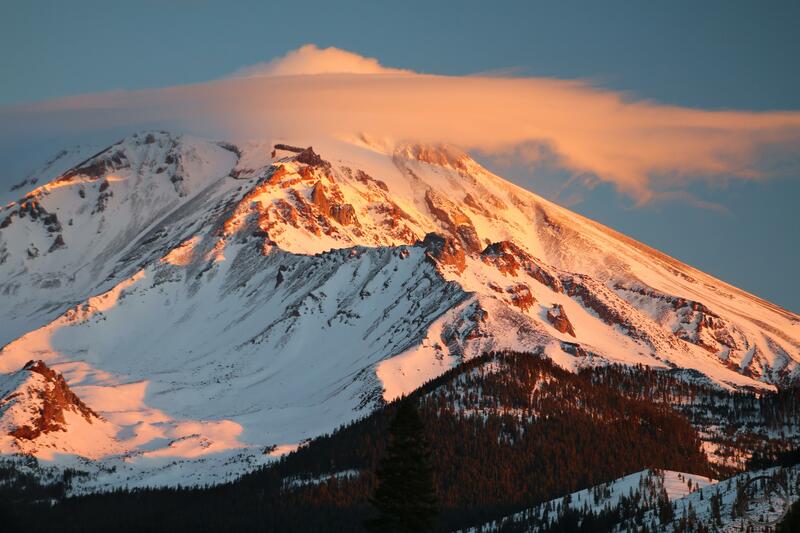 After seeing that and all the grandeur storming around Mount Shasta for the last week, I feel very small. 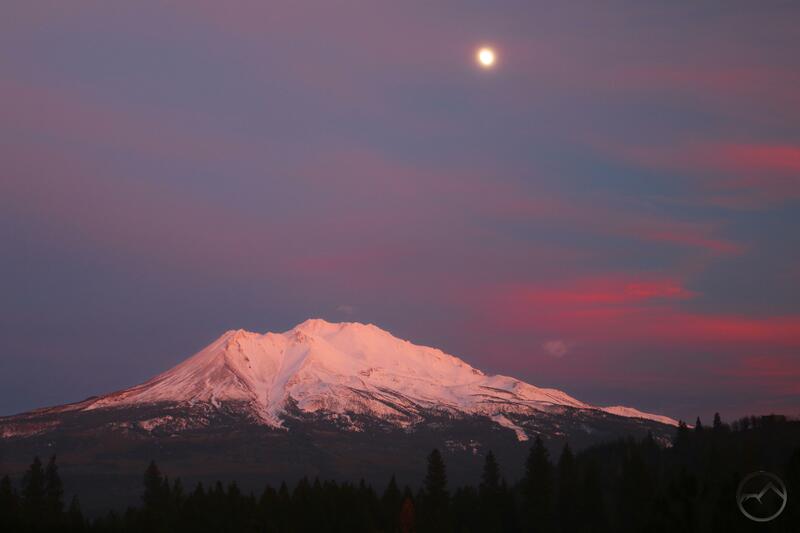 Sunset moonrise over Mount Shasta. The rainy weather of the last few days broke last night and it was nice a clear today. 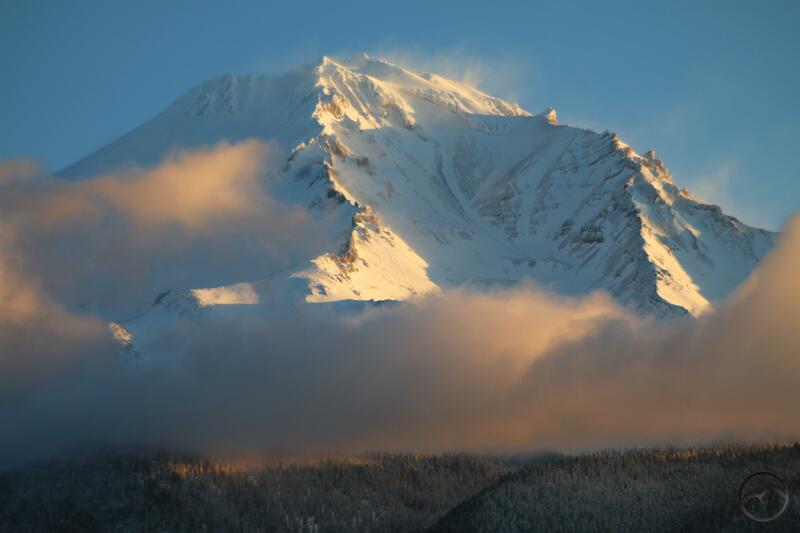 Mount Shasta looks beautiful in a mantle of fresh snow. I got up early this morning to see if there was an interesting sunrise and, although the mountain was visible, the sky was totally clear, rendering the sunrise beautiful but photographically it was not compelling. By this evening there were more clouds to catch the light, making the sunset more enticing. As an added bonus the moon was rising above the mountain. The clouds and color were noteworthy enough to post here. I hope y’all appreciate the view as much as I did. It has not escaped my notice that all I have posted about this month has been sunrises and sunsets. I hope to get myself back on track and spend more time writing about the mountains and trails soon. I had a handful of lengthy posts I had been planning on during the summer but the smoke killed all of that, I never got around to it and now I have been in a bit of a writing rut. I will be back on track soon I hope and starting putting up some more interesting articles, not just eye candy. That being said, looking at the forecast, it sure looks like we have a chance for a white Christmas…at least a little snow on Christmas Day itself. It would be wonderful if that would happen. If that is the case, I will try to post some pictures here. Until then, Merry Christmas! 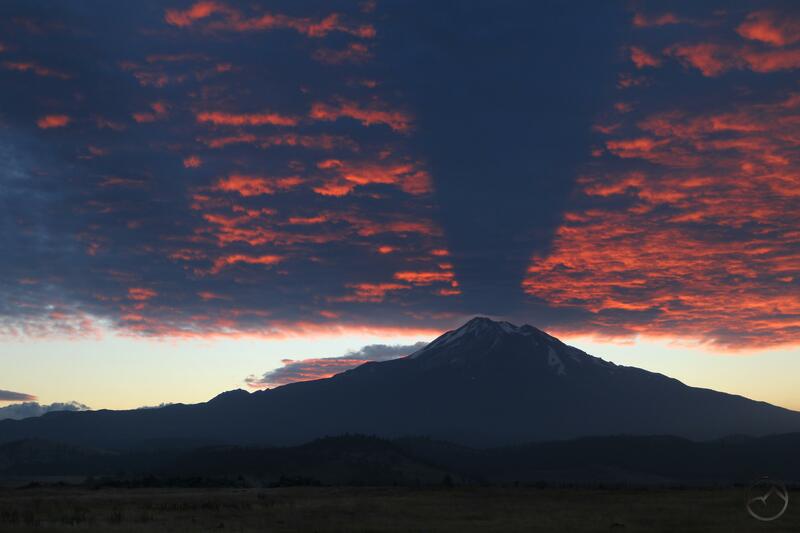 As the sun rises, Mount Shasta cast a massive shadow on the clouds above. Anyone who has followed this site for a while knows about my preoccupation with lenticular clouds. 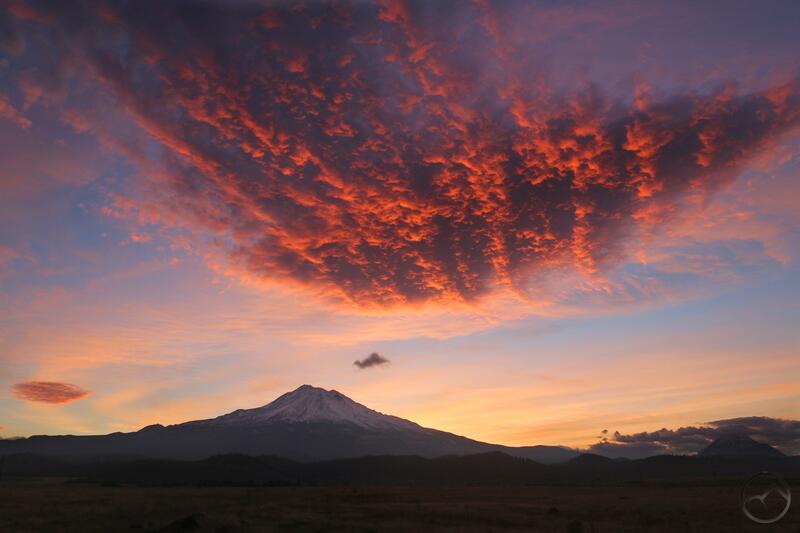 These unique clouds are one of Mount Shasta’s great features. However, while they are magnificent, it is not proper to highlight them at the expense of some of the other awesome cloud events that are not lenticular in nature. 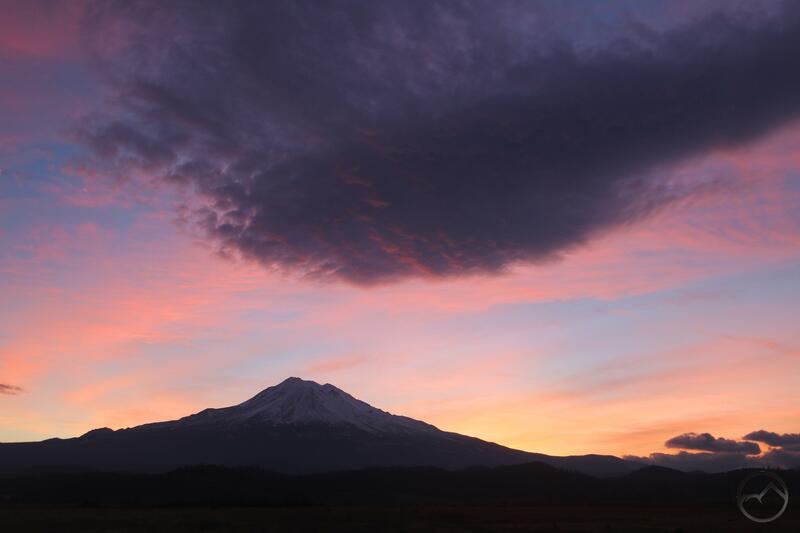 Indeed, Mount Shasta’s great size has long been known to influence the weather around it and, as if often the case, it makes for some interesting meteorological events. These, couple with the light from the rising and setting sun and the mountains own intrinsic beauty, can make for a truly spectacular spectacle. It is here in this gallery that I hope to highlight these other events. 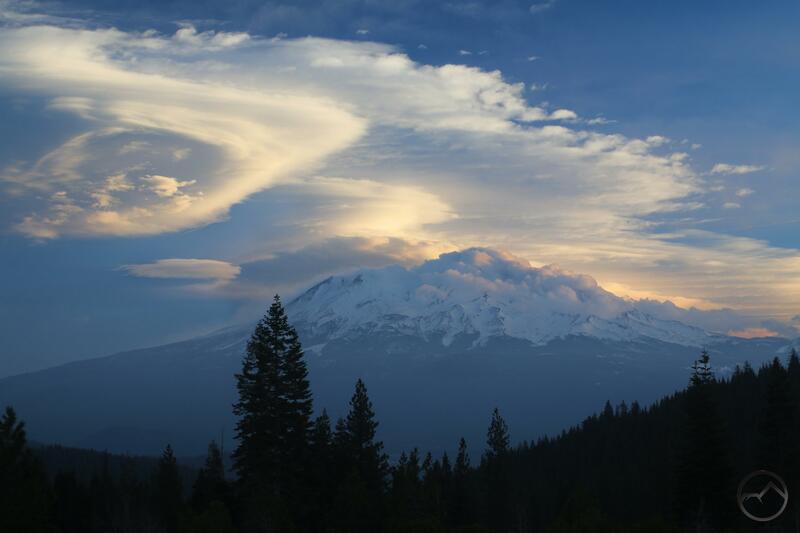 A lenticular tries to form above Mount Shasta. It would dissipate moments later. Looking at the forecast a few days ago, I knew that the weather systems passing through the area meant there would be a decent chance of a lenticular making an appearance. The spectacle didn’t seem too likely this morning, with hazy skies and uninteresting clouds surrounding the area. However, shortly after noon there seemed to be something trying to take shape to the south of Mount Shasta. At the time I was taking my junior high outdoor education class to the Squaw Valley Creek Trail and wasn’t in a really good position to stop and capture it. As we headed back toward Mount Shasta the cloud had morphed, taking on a strange, avian appearance. The whole formation seemed very unstable. With the cloud off to the south, I reckoned the best perspective might be to the north. When we arrived at one of my favorite spots the cloud had altered its appearance yet again, this time looking something like a volcanic eruption billowing from the summit of Mount Shasta. I set my camera and began snapping images while my kids played in the bushes, oblivious as usual to the dramatic pyrotechnics playing out on the slopes of Mount Shasta. While watching the show, a small lenticular stack suddenly tried to form over the mountain. As quickly as it formed it collapsed into wispy remnants. The large billow remained however and continued to capture the shifting light. It was a beautiful display and just the kind of scene I have been waiting for. It has seemed like a long while since I have had a chance to capture anything really memorable. This didn’t quite rise to the level of a really noteworthy lenticular but it was one of those sunsets that will be hard to put out of mind and will remain with me for quite a while. I am grateful to have been a witness. 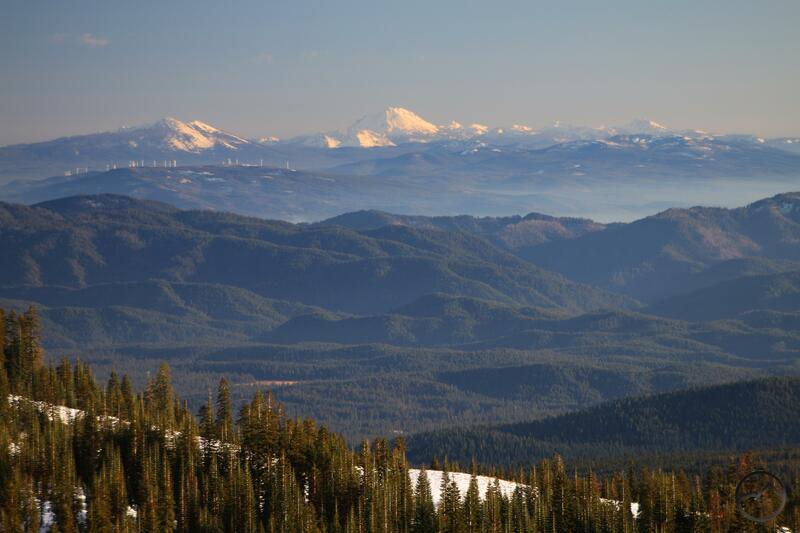 Clouds speed past Mount Shasta as the morning light highlights the mountains western ridges. I don’t have much to say with this post, other than to express my gladness that we have returned to the season when nearly any sunrise where the mountain is visible features some spectacular spectacle. It could be clouds racing past the mountain, the low light reflecting on the icy slopes, fresh snow blowing off the high points or unusual cloud formations. The short days mean easy access to sunrise and sunset. 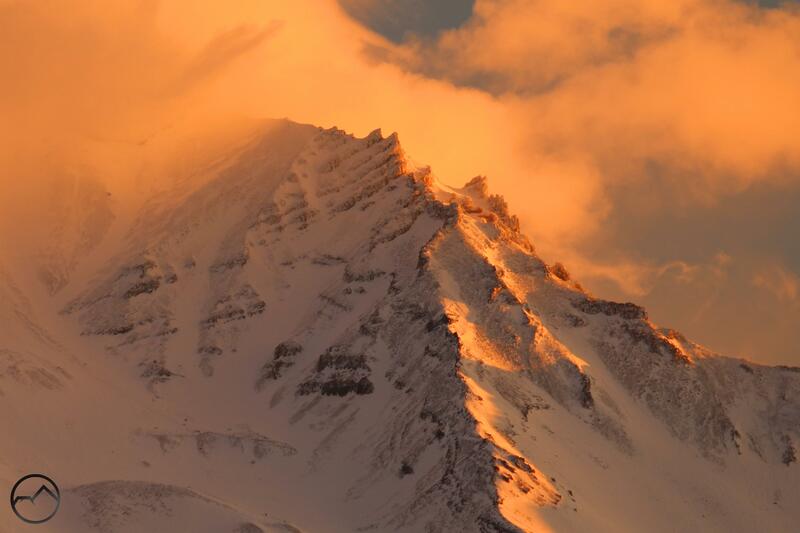 It is great time for enjoying the mountain from afar, provided no storm clouds obscure it. This morning I took my son down to Lake Siskiyou, where the 25 degrees felt a lot colder than it was. I was disappointed that the lake was not still but the clouds made for interesting close ups on the upper reaches of the Mount Shasta (I really need a better zoom lens!). Most of the places to the north were blocked by clouds and further east also looked to be clouded in. Despite the lack of reflection, this seemed like a good option. That turned out to be the case and the low trajectory of the sun meant the color lingered for far longer than it normally does. My son, of course, was busy chunking the clay on the receded shoreline, more interested in the mess he was making than the grandeur around him. There is a lot more precipitation coming soon. 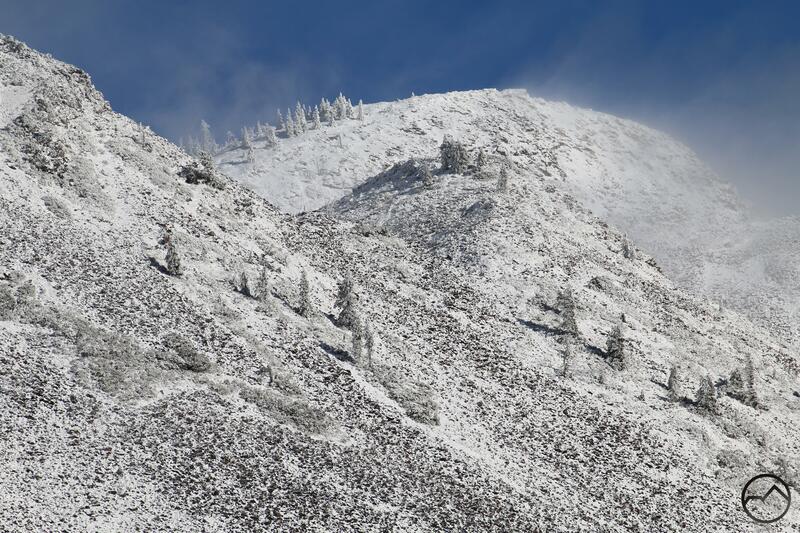 Enjoy the clear sky and white mountain while you can!